Today is my stop on the Siren's Realm Blog Tour hosted by Giselle at Xpresso Tours, I Have an Excerpt and giveaway and i will be posting a review soon after. Megan O’Russell is thrilled to have published her premier novel The Tethering with Silence in the Library Publishing. Originally from New York, Megan is a professional actress who spends her time traveling the country for different shows. When not on stage or writing, Megan spends time with her beloved ukulele and her wonderful husband. 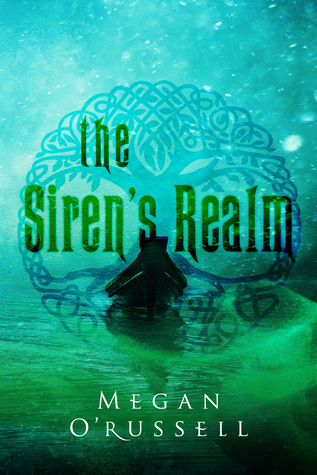 To follow Megan’s writing adventures, you can visit her website at meganorussell.com. A faint breeze tickled the back of Jacob’s neck. He turned to see the door shutting silently behind them. They stood in a huge hallway. A ballroom opened in front of them with windows looking out onto the ocean. The hallway was lined with large doors on either side, but there was not a person in sight. Emilia pointed toward the ballroom. It was the only open door and the only source of light. Jacob nodded, and they started forward, the thick carpet muffling their footsteps so the silence remained. They reached the foot of a staircase that ended next to the ballroom doors. As they passed the stairs, the doors to the ballroom slammed shut with a boom that echoed through the house. Jacob pulled Emilia back, looking for someone who could have closed the doors, but still they were alone. closer, creeping steadily toward them as more and more doors added themselves to the growing chorus of clangs. Crash, crash, crash. Jacob cupped his hands over Emilia’s ears just as all of the doors in the hall opened and slammed at once with a sound like a cannon that ripped through the house. “Up we go?” Jacob asked, finally lowering his hands from Emilia’s ears. Jacob followed Emilia up the ruby red, carpeted stairs. The staircase turned back on itself before reaching the second floor. Jacob expected to see another hallway, with more slamming doors. But in front of them was a silk curtain of deep violet. Jacob looked at Emilia nervously.